Could that mofo draw or what? Intense training in drawing used to play a major role in the education of architecture students. No longer. By the way, I have no idea if this particular column capital is an original or a reproduction. 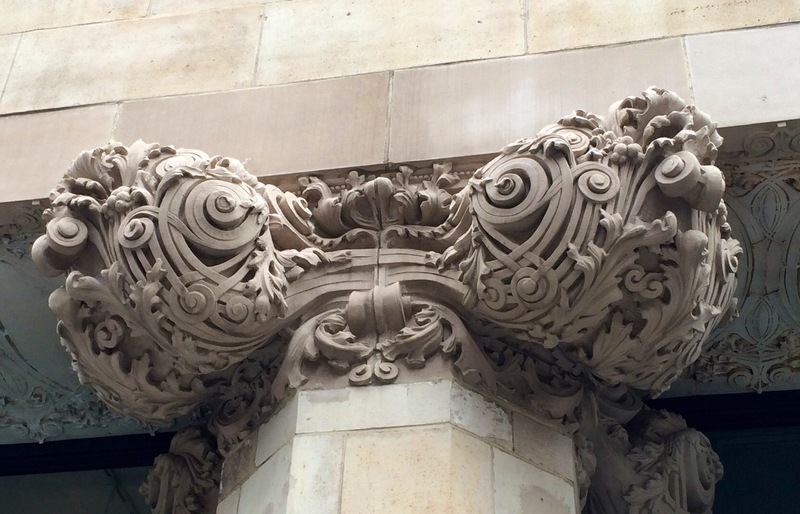 In 2000, when renovation work was begun on the building, it was found that only one of the original column capitals had survived, so the others were modeled on it. One of the more demented assertions that was peddled in the Modernism-besotted architecture history classes I attended back in the ’70s was the notion that the Bayard-Condict Building (as well as other Louis Sullivan works) were great because they were proto-Modernist. I remember thinking that one over really hard. Impossible to dispute that Sullivan’s buildings were often, for their era, tall; that they sometimes stirred up controversy; and that they were built on steel frames. Otherwise … Well, it seemed perfectly apparent to even Youthful Idiot Me that what Sullivan was mainly up to was exploring the possibilities that new technologies and materials offered while simultaneously folding his buildings into their contexts and harmonizing them with their surroundings. Which would put him on the side of continuity, extension and respect — ie., traditional architecture and urbanism — and most definitely not on the side of Modernism, which was (and which remains) theory-driven, geometry-obsessed, determined to make creations that stand out instead of fit in, and defiantly determined to break with the (awful/evil/oppressive/unenlightened/etc) pre-1930s past. But if your whole point is to maintain that all of architecture history leads inexorably, unavoidably to your one personal favorite style, then I guess it’s unavoidable that you’ll be overlooking an awful lot of what’s perfectly obvious to anyone with a non-brainwashed eye. There are lots of views of the building to be enjoyed on Flickr. A quick, fun look at some NYC buildings that, like the Bayard-Condict, made great use of terra cotta. Color! Decoration! Delight! This entry was posted in Architecture and tagged architecture, Louis Sullivan, New York City. Bookmark the permalink. Last summer, I visited Buffalo, and delighted in several examples of terra cotta buildings there, including this Sullivan building, and others, e.g. this one and this one. The facades for this building, and those of most other classical style buildings in the US, are manufactured by Gladding McBean, which is located in the town I live in. I got to tour their 100+ year old factory a few years ago, it was absolutely fascinating. They have 100+ year old molds used to repair facade elements, and the breadth of their work is incredible. The methods haven’t changed much throughout the decades. My favorite part of the tour was when they led us to the massive building holding the giant kilns used to harden the terra cotta. The gift shop was actually inside an unused kiln. A great example of old world craftsmanship staying not just in the country, but in the same small town. And it’s still a family owned business. The factory itself is really cool, it looms on the outer edge of town and would be a great movie set. I was wrong about it still being family-owned, oh well. Still, what a great bit of info, thanks. Would love to take that tour.